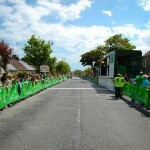 The An Post Rás is Ireland’s number one cycling event. 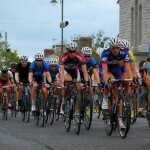 It is an annual, eight-day, stage race around Ireland. In 2006, it finished in Skerries for the first time. The local committee arranged such a brilliant welcome for them that they have been coming back ever since! 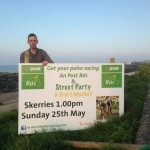 In 2015, the committee (under the umbrella of the Skerries Community Association) celebrated 10 years of the Rás finishing in Skerries, and arranged yet another successful street party to welcome in the Riders. The sun shone, and a large crowd awaited them at the picturesque seaside town, bringing eight tough days in the saddle to a stirring, atmospheric end. Paul Deans, Chairperson of the Skerries Rás End Stage Committee said, “We are truly delighted that a combination of an amazing local spectator turnout and our efficient organisation of the event in previous years have again put us on the map for the end stage of the An Post Rás “. Be part of the team for 2016 – contact their email address to get involved. Local businesses can become sponsors, too – a great opportunity. By the way, An Post Rás – Skerries Stage End Committee were the 2013 recipients of the Jim Quigley Volunteer Group of the Year Award!